Being frugal on the homestead is a way of life for most homesteaders. Learning vintage skills and frugal ways of doing things is often a way of survival. Many new homesteaders learn these skills from their grandparents, generations that were homesteaders from the start. There is a lot that grandparents can teach a new homesteader. 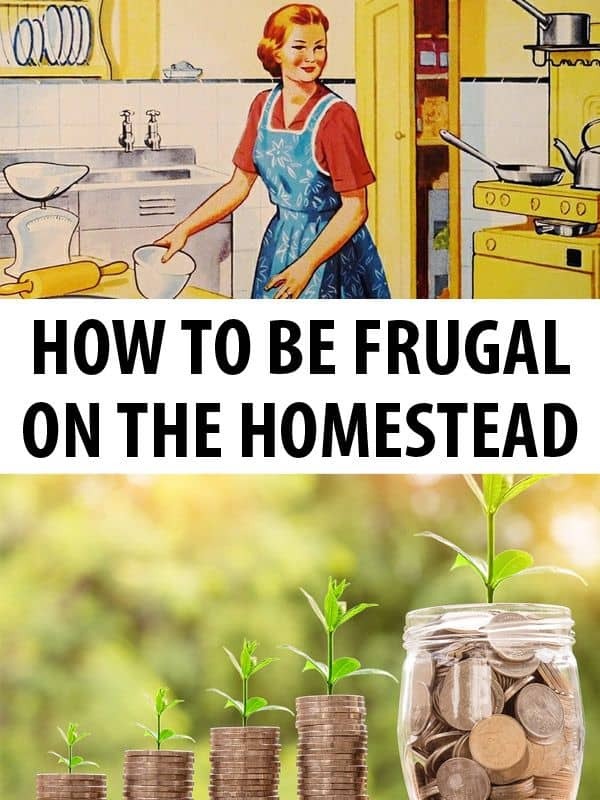 Here are some tips and tricks on being frugal that I’ve learned from my grandparents who had a homestead. From the time I was a young child my grandmother used to quote to me, “Use it up, wear it out, make it do or do without”. For some reason that particular quote stayed with me and today, when I work on my own homestead I often find myself thinking that as I ponder what to do with something and I’m considering tossing it out. If I can’t find an immediate way to repurpose something, I’ll often set it aside for a few weeks and ponder the value and usefulness of the item until I have an epiphany at which point, I will repurpose it. This isn’t just frugal, it’s a great way to keep from having to throw something out that may still have other uses. It’s also a great way to save money by not having to buy something brand new when I have my epiphany of what to do with said item. Before we start, it’s important to understand that there is a huge difference in being frugal, and cheap. Frugality is all about using what you have on hand and re-purposing it until it has no more purpose left in it. Learning to stretch your money to make the most of what you have and in an effort to save as much money as you can possibly save. Learn to consider quality over quantity. Quality can be frugal while cheap can be expensive in the long run because you’re going to have to be constantly replacing things that were cheap to begin with. I had a friend years ago that saved all of her vegetable scraps in a bag in her freezer. About once a month (usually the day before payday as she was flat broke) she’d take this bag out of her freezer and put it all in a soup pot. She’d then fill the soup pot with water and simmer the scraps in her soup pot for several hours. After a few hours she’d strain out the vegetable scraps (usually these were peelings, pits, end pieces that she had cut off of her vegetables as she prepared them for a meal). She’d then go through her refrigerator and grab out bits of leftover foods such as that tablespoon of rice or potatoes that were left over from a dinner, a few bites of this or that and so on. She’d put these into the broth and simmer them the rest of the day seasoning the soup here and there as required. She’d make biscuits or dumplings for the top and serve this for dinner that night. We called it soup, her daughter called it garbage soup. Whatever it was, it made a delicious meal that was using up scraps and leftovers. Bone broth is another thing to make in your kitchen. Those bones you remove from meat as you’re eating can all be saved and boiled into a delicious and nutritious bone broth. Simply save all the beef in one bag, chicken in another, pork in another and so on. When you have a kettle full or enough for a large crockpot, put them all in and add water. Let this simmer all day long. Some people put a tablespoon of vinegar into the bone broth to help leech the marrow out of the bones. It makes them softer and if you don’t use too much you won’t notice the vinegar taste in your bone broth. I was at the doctor recently and my doctor asked me if I drink bone broth. I told her no and she told me that I should be drinking it, according to my doctor, if I drink bone broth I’d feel healthier, more energetic, and my joints won’t ache as much. I have to admit, after I tried it, she was right. Cooking from scratch is another way to be frugal in the kitchen. It’s healthier to know what is in your foods and many prepackaged foods contain chemicals and other preservatives that can affect your health. It’s quick and easy to make your own mixes such as pancake mix, biscuit mix and so on and store them in a jar. It’s also a great way to save money. Whenever possible, we buy in bulk at our homestead. This saves us a lot of money and we have plastic and rubberized bins that we put such things in as flour and rice. When we find something on sale that we use frequently we also stock up on it at that time. I’d like to say we’ve quit using paper towels, but we still keep them on hand for some things. However, I have a strategy that has helped me to reduce our paper towel usage. We have old ripped up towels that are now used to sop up spills (including puppy accidents) and we have newspaper that we often use to sop up liquid that spills and strain grease. Newsprint is also ideal for draining fried foods on. We also dehydrate and can a lot of our produce from our garden and the fruits from our fruit trees. This helps me to stock up our pantry and in the winter months it’s fun to go and grab a jar of peaches out of the pantry and whip up some peach cobbler. Learning to can our own food has saved us a lot of money and everyone can help from picking the food to preparing it for the canning process. It’s a fun family event that everyone can participate in on our homestead. Most of my cleaning products are made at home. I rarely, if ever, purchase a cleaning product. Instead, I use vinegar, baking soda, lemons and avoid unnecessary chemicals and focus on all natural cleaning methods. It’s amazing how easy it is to clean with these products and my house smells wonderful and fresh. I’ve saved a lot of money on cleaning products and used the money I’ve saved to build our savings account. Frugality in the garden for us started with our compost pile. Everything that can be composted from the kitchen and the rest of the homestead is put in this pile as well as grass clippings, leaves, and plants at the end of the season. What results is a nutrient rich compost that we incorporate back into the garden. The result is free compost and a lot of great blooms on the plants. This also makes our garden organic as we don’t use any commercial fertilizer on our plants. It’s a great way to raise a healthier garden. I’ve learned, over the years, how companion planting works. By companion planting my garden is thriving. I plant climbing plants around taller plants like corn and allow the climbing plants to climb up and around the corn. I don’t plant enough to choke my corn out, but it really helps to be frugal and save space in my garden. If you’re going to be canning and dehydrating you can plant a little bit extra so that you’ll have plenty. Thanks to being frugal and saving our seeds and using our own compost, this is easier than ever. You can also sell your excess produce at a produce stand, farmers market or to neighbors and friends. It’s a great way to be frugal and will help you to stay within your budget. Every year we save some of our seeds from our seed bearing plants. These include such plants as peas, beans, squash, and yes, even tomatoes. I allow them to sit on a plate and dry turning them occasionally to make sure they aren’t molding underneath. The result is free plants for the next gardening season. I store them in an envelope and label each envelope and when it’s time to plant the following season, I have free seeds. I’ve been doing this for years now and I’m not really sure when I last bought commercial seeds. Just make sure that the first set of seeds that you purchase are heirloom quality. I know that many areas have regulations on saving rainwater, there aren’t any laws on this in my region so we have rain barrels that we have put at the bottom of our drain spouts on the barn and on the house. I then fill my watering can with this for watering the flower beds. We have a hose attached to the bottom of our rain barrels and have them strategically placed near the garden so that we can also use this water for watering our garden whenever possible. Yes, we still have to turn the water on now and again, but the rain barrels do help us to reduce our water consumption and be more frugal. We keep tools in all of these locations so I’ve combined this category to make it easier. Keep your tools in good repair. I store all of my gardening implements such as shovels, trowels, and so on in a bucket that has a bit of oil in the bottom of it. This keeps them lubricated and helps to prevent rust. We also buy tools and garden implements that we may need at 2nd hand stores, yard sales, and other used venues that we find along the way. Some of the tools are hand me downs from my dad and my grandfather. As long as the working portion of the item is still useful, we can always add a handle. Speaking of handles, my husband had a habit in our younger years of getting up very early and driving through the small town nearby. He would grab the few items we may need at the grocery store first thing and then go behind businesses where he’d previously received permission to pick up scrap wood and other useful items. These pieces of scrap wood and pallets made great replacement handles for many of our tools and even the ax. My husband did this for years. Today, we have a nice stack of wood scraps and pallets that we use for various projects in and around our homestead. The bits leftover from those projects then go into our wood supply for the upcoming winter months. This frugal habit has helped us to build a virtually free shed, wood shed, and patio awning. Next on the list is a dog house and another deck in another area of our yard. All with scraps that we’ve picked up over the years. My husband also managed to pick up a roll of slightly used carpet that carpeted our house. Not a thing was wrong with this carpet. There were no stains, no rips or tears. The owner of the carpet shop said that a customer had his home carpeted and gave him the old carpet. We really appreciate the carpet under our feet in the morning and there is absolutely nothing wrong with this carpet. It even matches the colors in our living room. My husband also had a habit of swinging by nearby construction sites and getting to know the construction workers. After getting to know several of them, he offered to haul off their leftover scraps, yep, right to our barn. I think we have a few stalls that have not only wood scraps stored in them, but also insulation (rather than take a partial roll back one company always threw it out so we have plenty of insulation) and other items that eventually will be very useful on our homestead. Grow your own feed for your animals. Many homesteads have plenty of space to grow alfalfa and other feed for their own animals. They sell part of what they grow and store the rest of it in the barn for winter months. If you don’t have the proper farm equipment get together with a few other homesteaders and work out a bartering deal. Learn how to butcher and preserve your own meat. Not all homesteaders have the heart for this, but some do and for those that do they can save a lot of money. When you consider that the average price to butcher and process a side of beef is nearing $600 or more, you can save a small fortune if you learn how to do this on your own. The same goes for other kinds of livestock. Once you’ve seen it done professionally a few times, you can learn to do it all on your own and save a lot of money. We’ve learned how to make many of our own repairs, change our own oil and do minor repairs that don’t require a professional with professional equipment. Over the years we’ve saved a lot of money. We do, however, hire a professional for electrical issues and things that may be over our heads. Being frugal means knowing when to call for help and when to do it yourself. Being frugal doesn’t mean not giving gifts, however, in on our homestead everyone has some great hobbies that allow them to hand-make the most wonderful gifts. From wood crafts to sewing crafts we’ve always got an idea going for the holiday season. We also watch for things that can be made over into something new, updated, or might be brand new even though they are at a thrift store or yard sale and buy those for gifts. One of my daughter’s likes to make wind chimes and she’s actually very good at it. One year she made a great set of wind chimes out of fishing line, old silverware, a few small sized pan lids, some can lids from food cans (she filed the edges so there aren’t any sharp edges) and was actually getting orders for them when she finished. Another daughter loves to crochet and she has taken anything from plastic grocery store bags and bread wrappers and crocheted them into bags or mats. She also uses old worn out sheets to make rugs and other items. She has amazing talent and will peruse a list of ideas that she has or the Internet to find something to make. She often gets orders for these as well. All it takes is some creativity and using what you have on hand and you can have some great unique gifts that everyone loves. You’ll love saving the money and you’ll have gifts that are far more personal as people will know that you made these gifts specifically for them. Being frugal can have a huge impact on your finances. Learning to live a frugal lifestyle works wonders to ensure that you always have an emergency fund and money on the homestead. Being frugal helps homesteaders to be more resourceful. It helps them to utilize what they have on hand before they go out and buy something new. It’s amazing how many items on the homestead have a dual purpose. You’ll be living greener and more environmentally friendly when you’re frugal. My laundry smells cleaner and fresher when I hang it out to dry. It saves money on the electricity and if I do need to simply fluff something it only takes about five minutes once it’s dry to toss it into the dryer. We opted to not have a dishwasher as they use a lot of water and electricity. Instead, I made it a special time with my kids where we share about our day and everyone helps. One person washes, one dries, one puts things away. One of the things I love most about living frugal, is that I don’t tend to buy as much. What I do buy has meaning and purpose. I don’t collect as much clutter that way and By giving some thought and consideration to what I am going to buy, I’m able to watch for deals and stay within my budget. I’m never bored as being frugal gives me plenty of time to make things over and upcycle things. It’s become kind of a hobby of mine. With less need for money I don’t have to work as hard at paying jobs so I have more free time to work on projects that I love. Most of our clothes are purchased at second hand stores, this allows us to save a lot of money on our clothes and if something is ruined we don’t have to stress over the expensive clothing items that we messed up. I limit myself to a week’s worth of clothes (since we have a washing machine I don’t have to have as many clothes as someone who has to go to a laundry mat). It also makes it easier and quicker to get dressed as I don’t have a huge closet full of clothes to choose from. It’s amazing how much easier it is, personally, I would have to say it’s liberating. Life is less stressful when you’re frugal. You don’t have to keep up with the neighbors or anyone else. You’ll be amazed at the level of happiness you develop when you’re practicing being frugal. Being frugal has helped us to live debt free. We’ve been able to take our extra money and pay off debt faster which not only feels good, it also raised our credit score and allowed us to stop feeling stressed over how we were going to pay our bills. Our kids have learned new skills and vintage skills and made their own spending money by creating unique one of a kind gift items for friends and family. They can sell their extra gift items at boutiques, bazaar’s, Farmer’s Market’s, and enter them in the fair. Being frugal on our homestead has helped us to pay down our debts, pay off our mortgage and make some new friends. It’s also helped my kids to learn to live off the land and to make better use of their time. Hello Great site.Keep going. Love to visit it regularly. I have tried to grow my own food but we now have no water for the garden. We are in drought. Very disheartened I have turned my sight onto inside savings. One thing I have learnt from sites like this one is how to use only what you need and anything left over find a way to use it, reinvent it, revamp it. Composting, Worm farms, Chooks, are not only great but you can sell the produce from if you cant use it. Because of the drought I am having to buy in bulk from where-ever I can buy from reliable organic sources. I then preserve what I dont need straight away, canning, freezing, dehydrating,and fermenting. There are other ways to be frugal. I dont buy toilet paper or cleaning supplies and no I am not dirty. I use wet cloths (which are set aside for this purpose only) to wash myself after going to the toilet. I make my own environmentally safe cleaning products. Soap making is turning into a good hobby. I have turned my hot water off and top and tail each morning. I shower once a week turning the hot water system on when it is reduced rates. I throw a small bucket of water down the toilet once a day to flush,I have turned of the tap to the toilet that refills it after every flush. Where I live you pay for water, utilities and everything the shire council can charge you for so by using as little as possible saves. A camp hot water shower run by a gas bottle is cheaper than electric or solar. There are many ingenius ways you can save not only money but water, and maintenance and replacement of equipment. Hope this helps. This is an interesting blog. It takes me back to being a young wife/mother. First let me share that I had little to nothing as a child growing up, this included six children, five brothers and one girl. I cannot say I was starving only I truly know and understand what hunger is. The summer before my eight birthday was one of the worse, many times the only thing we had to eat were the potatoes that my sixteen year old brother brought home from the potato farm where he worked. The only time I reverted to stealing was that summer. I would steal vegetable from several neighbors’ gardens then sneak to a river, sit on the bank, and eat until I was sick. Many years later I could not “waste” food because of fear of going hungry. I placed a quart container in the freezer and added leftover foods into it: corn, green-beans, peas, meat, gravy, etc., etc., etc.. This food-gathering would be made into soups. As an adult, I have taught myself how to can and dry foods. Please know, the New Life on the Homestead blog is very special to me. Thank you. A note about using a dishwasher: most, if not all, new dishwashers actually use less water than washing dishes by hand. If you fill your sink with soapy water to wash dishes, you use more water than most dishwashers use in a regular cycle. I have so much going on here on our homestead that it’s worth the electricity cost (which for us is less than $0.10 per load, plus less than $0.10 for soap). If I wash by hand, I’ll be using more water, using my precious time, and using the same amount of soap. Just something to consider. Frugality is absolutely necessary on most homesteads; we are extremely frugal, and use many of these methods and more. Of course, we’re still building up. We have lots of exciting new projects coming up (like our rabbit colony that we’ll be featuring on the blog), and upcycling definitely helps us to save more! I also save plastic containers for growing some plants and seeds, saves a lot of money when the spring comes along! Great post! Enjoyed the article, any way that we can save money is a blessing. I will look into trying some of these. Thanks! Frugal mindset can extend assets – and it’s how most people survived food challenges in our less-than-abundance past.